Osteoarthritis is a particular type of arthritis and is the most common type of arthritis which afflicts individuals. Patients who suffer from this condition suffer from the thinning of the cartilage that is between bones. This cartilage then become remnants over time and complete destruction of the cartilage ensues. There are some bodies of research that show Marijuana can assist in reducing the pain caused by Osteoarthritis and can significantly reduce joint damage as well. This disease is a degenerative joint disease and the wearing of the cartilage which is a protective barrier for the bones causes rehabilitating pain. Osteoarthritis can occur at any particular joint within the body, however the most commonly afflicted areas occurs along the spine, the hips, hands and knees. The cartilage has a very important role to play within the body. The role of the cartilage is to enable the bones to move freely with the joints. When this cartilage becomes broken and rough as it does during osteoarthritis, it eventually disintegrates and completely diminishes. The bones and joints then rub against each over. Pain then ensues either during or before movement, or both. The joints becomes incredibly sensitive and stiff. Flexibility is diminishes almost completely and the friction between the joints and the bones creates further pain and spurs. Eventually the condition can worsen to a point were everyday activities become nearly impossible- this is mainly due to the intense pain that movement can cause. when the spine becomes afflicted, the nerves along the spine can become pinched or comprised with the crumbling cartilage; in this severe case movement is almost completely out of the question. Because there is no cure for Oesteoarthritis the damage done to the cartilage can not be made right again. The remedies offered by professionals include treatments aimed at rehabilitating the progress of oesteoarthritis and. Of course, pharmaceutical pain relievers. It comes as no surprise then that more and more sufferers are turning to medical cannabis for its pain relieving properties. There are thousands of individuals who have been on pain relievers for many years and are seeking an alternative to the over the counter drugs or prescription medications. Many studies have been conducted and clinical research and trials that have studied the herb and its effect on the disease are few and far between. However the few studies that have been done have yielded promising results. Marijuana has shown an ability that is likened to strong anti-inflammatories. The pain reducing effect of cannabis has been studied more than the anti-inflammatory effect and both of these qualities have shown up in clinical cannabis research. Preclinical studies encourage the thought that oesteoarthritis pain is relieved by the endocannabinoids within cannabis. Furthermore, research has revealed that the cannabinoids not only offer anti-inflammatory support however they also have the potential to dramatically reduce the damage that was caused within the afflicted joints. These results were shown in studies conducted with mice afflicted with osteoarthritis. Osteoarthritis causing pain within the patient that is either neuropathic, nociceptive, or both. The cannabinoids from marijuana work with the endocannabonoid system, particularly the CB1 and CB2. Both of which are receivers within the endocannabinoid system. The relationship that is triggered between these receptors and the cannabinoids causes the CB1 and CB2 to release cells that act as a pain manager. These cells can be either central nervous system cells, neurotransmitter cells, or both. These cells then act to manage the pain, whether the pain is nociceptive or neuropathic. In a study conducted with rats, the CB1 was found linked to reducing pain and joint sensitivity in the knee joint. In a separate study conducted in 2013, the active CB2 diminished inflammation and pain linked to osteoarthritis. Prevention is always better than cure and the key to prevention of Osteoarthritis is to keep bones and joints as healthy and nourished as possible. Additionally, marijuana and the cannabinoids found within marijuana assist in bone growth and the care taking thereof. The cannabinoids trigger the CB1 and CB2 thereby assisting in maintaining the bone formation. 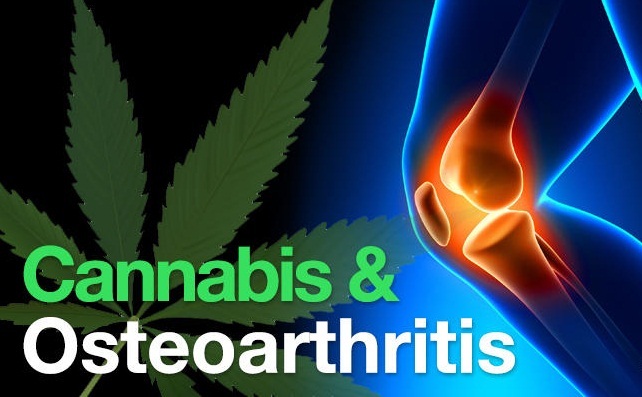 Oesteoarthritis in particular has not been made a legal condition for medical marijuana however medical marijuana can be prescribed for arthritis and all types thereof in New Mexico and California. Other states like Washington allow the Dc-licensed doctor to decide medical marijuana for any disease or ailment. California, Colorado and Rhode Island also also prescription of medical marijuana for Oesteoarthritis however the states of California and Nevada allow recreational use and retail of marijuana so a doctors prescription is no linger necessary. The number one strain of cannabis recommended for Oesteoarthritis pain would be Harlequin. Harlequin is a mostly sativa strain that has a higher level of CBD. The ratio of CBD to THC is 5:2. The cannabinoids within this particular strain are soon pain relievers and also harbour antioxidants as well as compounds known to be neuroprotective. This strain has anti-inflammatory properties that assist with the pain associated with any type of arthritis. If you are struggling to find this particular strain then look out for another strain that has a similar CBD:THC ratio. Additionally, you can ask at your local dispensary for the best strain that can assist in relieving severe pain, particularly pain caused by inflammation. Feel free to be open about your arthritic condition with the dispensary staff as almost all of the individuals who work at dispensaries are passionate about marijuana and are very knowledgable about its healing properties.